When the deck is stacked, how do you deal? YESNO is a playful view of a planet on the verge of a nervous breakdown. Humphrey Bogart meets Werner Herzog in the heart of darkness. 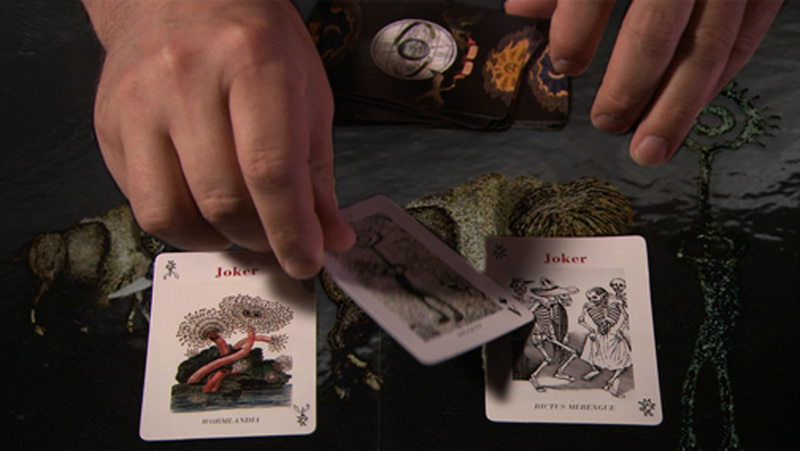 A conjurer shuffles bison, emu and orca in a game of extinction. animation, poetry and music, calligraphy and DNA. LOUISE GARFIELD (The Hanging Garden). was completed in May 2010. The soundtrack is mixed in Dolby 5.1. Premiering at the Toronto International Film Festival in September 2010, Yesno played the Atlantic Film Festival, the Woodstock Film Festival, the Vancouver Film Festival, Rencontres Internationales du Documentaire de Montréal (RIDM), the Whistler Film Festival, the Victoria Film Festival and the inaugural San Francisco Green Festival. To watch the full 7-minute festival version of Yesno, with animated credits, click here. How does one access this short in Connemara on the west coast of Ireland? Patrick, I will post the film on this site again once it has aired on CBC.